Beautiful old world look for a Eastern European painting . 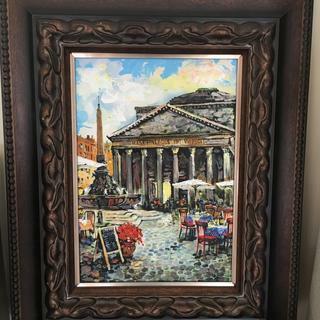 Perfect for our street artist oil painting from Italy!!! This is a great frame. Well built and the color and style are perfect for a Traditional look. I'm very pleased with it, and will be ordering more. 12x14 Oil on panel by Robert Whistler. This is a beautiful frame, I'm very pleased with it. The texture and tone of the frame is just stunning!! So happy with this frame I plan on painting a companion piece to frame as well. It was the wrong size. I assume maybe I ordered the wrong size, which I’ve never done before on the many orders with them I’ve placed. They offered to refund to cost of the frame with a return authorization. But paying $25 to ship the original wrong-size frame to Florida, then another $25 for the correct size replacement is not going to happen. Thank you for your purchase with us. I am sorry to hear that it did not come as you expected. We are happy to replace a frame if it was made the wrong size. Please feel free to give us a call should you need further assistance. 1800-332-8884. We would not make you pay for return shipping on an item if we have made a mistake and I apologize for any inconvenience. We look forward to hearing from you. What a gorgeous high quality wood frame! I am very pleased. It is a nice thick wide frame. Beautiful frame. Quality and appearance better than expected. We have a very special photo from a missions trip and needed a special frame. My husband loves carpentry and deeply appreciates woodwork so I was hoping to find something he could enjoy for many years. This frame was no disappointment! We received it so quickly and for less than 1/2 of what our local chain art and custom frame shop quoted us for their clearance frame. This is lovely and we couldn't be happier! Thank you! Now we just need to find another reason to order an additional frame because we loved this one so much! This is a good buy. It exceeded my expectations in terms of quality. When my farmer looked at it she was blown away at the quality for the price. It is now framing a valuable antique map from 1846 and does the job beautifully. 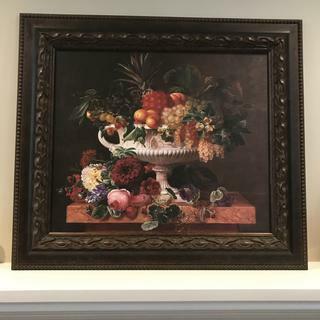 Beautiful frame and great quality! I wil definitely buy from here again. I am so impressed with the high quality and craftsmanship of the frame. The frame is custom made and solid wood. 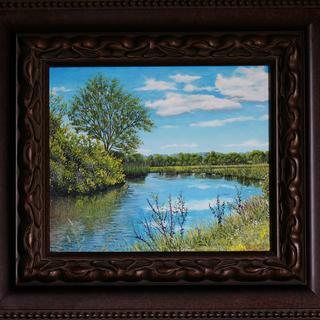 Simply gorgeous - I would have paid much more if I had gone to a local framing shop. The process to custom order the frame, mat, and glass, online was seamless. Thank you for the excellent work you all do! Fabulous frame. Way better quality than expected. Fabulous frame. Way better quality than expected. Shipped quickly and safely. Heavy and well put together. Could not be happier with my purchase! Very well made. Great frame and great value - looks like it cost 2x as much. I liked this cocoa frame very much. It looked great with both of my tropical themed paintings. The frame is very nicely finished and a heavy, good quality frame. I will probably order this frame again. this product is excellent. I would definitely buy again. 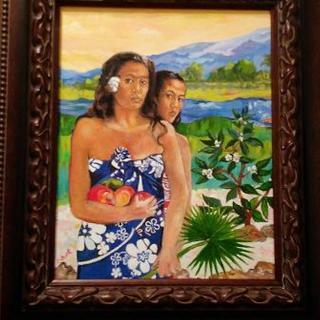 I'm framing a copy of a Gauguin I painted in college 40 years ago. Recently, I saw the original at an exhibit at the Art Institute of Chicago, and this frame had the feel of the frame on the original painting. It looks perfect with the print we chose! Seems to be the right style for my oil canvas from Italy. It fet the design of the room in which the frame is going. 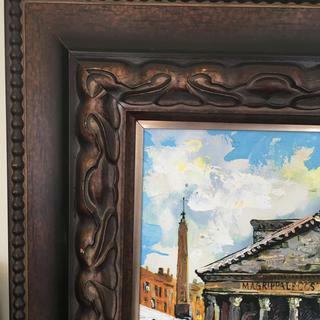 I chose another solid colored ornate frame for another painting and I think it's beautiful. This is what I always order for the bank portraits of our town's annual pageant winners. I love the beautiful, rich color, deep curves and width of this frame. I think it’ll be perfect for my canvas art. 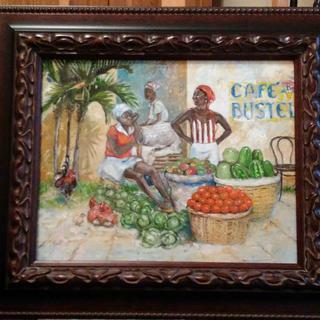 Style fits my artwork, which is tropical, while still being traditional and stately. Warm in appearance to enhance a castle painting . Needed the undertones of bronze that this frame is said to provide . Can this frame be use for a mirror? BEST ANSWER: Hello! Thank you for reaching out to us. We highly recommend using a Wood Frame for a mirror. This classy frame is perfect for a mirror! Please use the appropriate backing and hanging hardware. If you need additional assistance, please let us know. Happy Framing! BEST ANSWER: yes. handing hardware was included along with clips to hold stretched canvas in frame. Good quality. Yes, a hanging kit is included with all frames. Yes, hanging wire was included in my purchase. 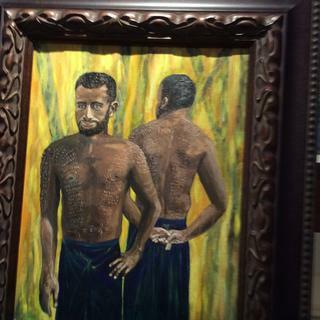 Will an oil painting on canvas with a stretcher 5/8 deep fit in the rabbet, please? BEST ANSWER: Hi Estell. This frame has a 1/2" rabbet depth so it will exceed the back of the frame by 1/8". Thank you! Yes, this wold be between the wall and back of the frame. If it is handing in place where it will not be brushed up against, you should not have an issue. 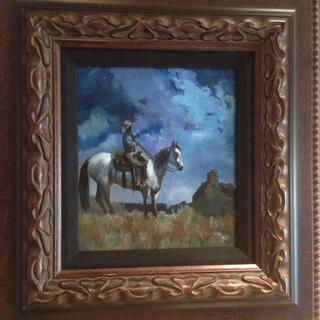 I have a painting that is on masonite and it measures 11" x 11 7/8". I want as much of the picture to show. How do I size the frame with a mat in order to show as much of the picture as possible? BEST ANSWER: Since you are working with a mat, our framing experts would be able to talk you through each step of ordering to ensure we create the correct size for you. They are available at 1-800-332-8884. Thank you! Can I use this for a 3/4 thick canvas? ......and do you think a painting of Jesus would look good with this style frame? BEST ANSWER: Hello Vincent! 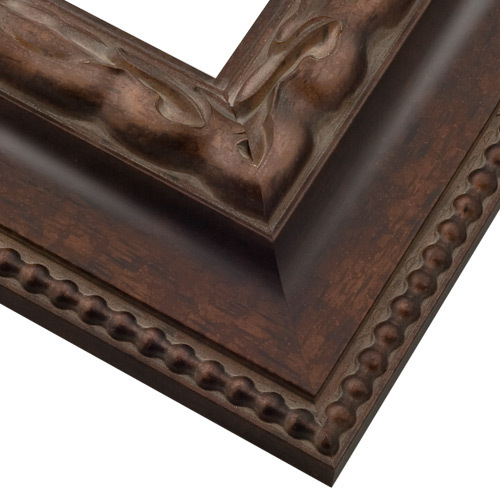 The depth of this exquisite frame is only 3/8". This frame style would be perfect to frame Jesus with, but the depth is not suitable. Could you consider going with the CLM4 from this collection which has a depth of 1/2"? 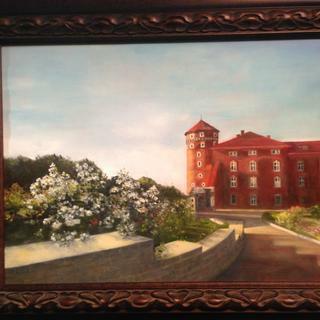 Please see the image of the frame below. If you do not like this frame, please search for 'dark brown' frames to find more frame choices. Let us know if you need further assistance. Happy Framing!